All my recent research into Bible translation reminded me of one of my favorite versions of Psalm 23. 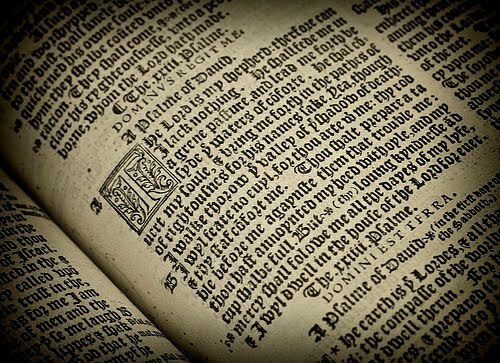 This is from the Miles Coverdale Bible, published in 1535 - that's over 75 years before the KJV hit the shelves in 1611. You can see some of this Psalm in the KJV, but it has it's own style. If this had been the first version of the 23rd Psalm for me, I wouldn't have been so confused as to why he doesn't want the Lord to be his Shepherd - "I shall not want?!?" and bring me forth in the paths of righteousness for his Name’s sake. thou hast anointed my head with oil, and my cup shall be full. And that is not how they talked back then. I have the 1534 Tendale Bibles; and the 1599 Genevia Bible, both of which are written in Old English. From the early 1960s the focus has been to re-translate even the older Bibles not only to modern terminology, but according to modern definitions; Which has totally and completely distorted what the Scriptures meant at the time they were written. I like reading many of the older English translations of Scripture. I wonder if you would mind giving some examples of which modern versions have "totally and completely distorted what the Scriptures meant at the time they were written." I'm not sure I follow your thoughts on this.